I had no clue what the red pips meant until you explained it. However, now that I know... I would rather have the red. The idea of it "costing" a food or two to work a tile makes much more intuitive sense to me (especially for 'at-a-glance' city production guesses) than adding up all the green pips and dividing by 2*size. Wahazar wrote: I have general question: what if certain tile production exceed 9, for example 10: did I get 10? and what is displayed in case of pip or standard numbers? JTN wrote: City food/prod/trade output is indeed clamped to 9 for display, if greater. Tilesets are expected to provide all sprites 0-9. There's no provision for any more yield than that. Still not sure, if tile output is clamped to 9 for display only, or also for real output? Only the display is "capped"; the actual output can be over 9. Your choice of a non-RoundSquare tileset to demonstrate the effect saddens me. Hans Lemurson wrote: Your choice of a non-RoundSquare tileset to demonstrate the effect saddens me. Sorry, it is my fault of provoking off-topic. But aren't hexes a slightly rounded squares? Wahazar wrote: Sorry, it is my fault of provoking off-topic. But aren't hexes a slightly rounded squares? No! They are totally different shapes with different symmetries and geometries! Hexagons are much closer to circles than Squares are, so if I ever make a Hex tileset, you can expect it to feature circles as the "rounded" version. And I will need to at least alter the existing hexagonal tilesets, because they all seem to fail in their understanding and display of basic geometry. Those Hexemplio tiles are NOT regular viewed from an isometric angle, they are ABOMINATIONS. 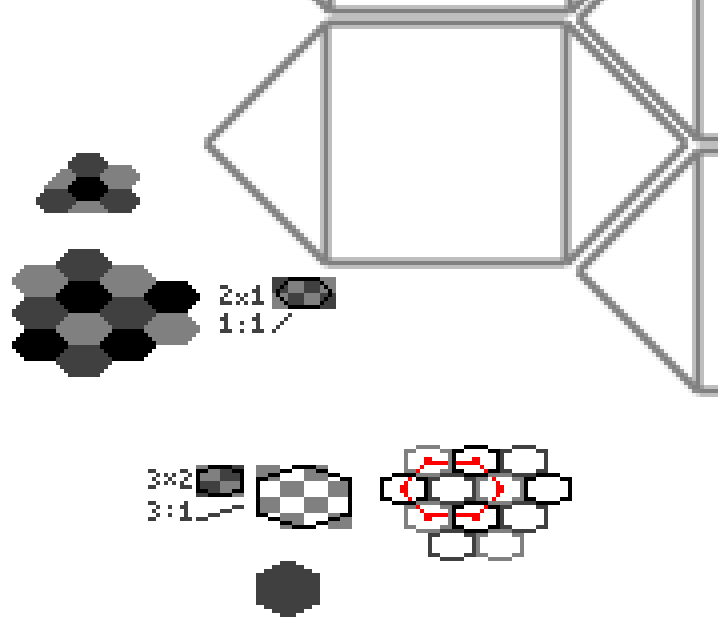 Hexagons viewed from the isometric viewing angle have a 3:2 width:height ratio. After accident with trireme caused by silly isometric aspect ratio, I definitely switched to rounded square overhead tileset for LT.